Hot Tub Chemicals - All Spa & Hot Tub Ltd.
Our store offers a wide variety of hot tub chemicals and natural enzymes to suit your needs. We have experienced and knowledgeable employees that can help you choose the right product and answer any of your chemical or hot tub related questions. 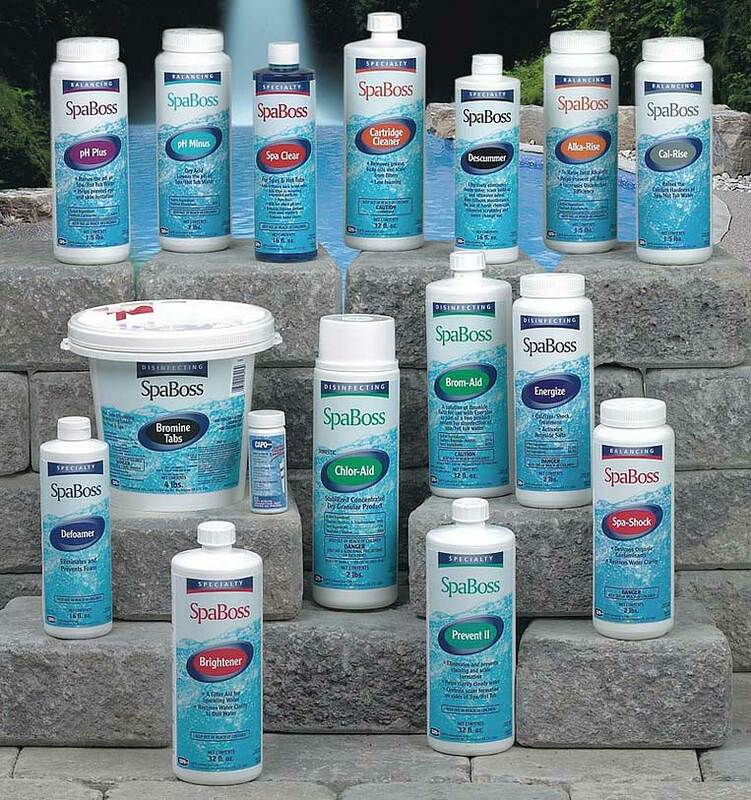 SpaBoss ® products are designed with the hot tub owner in mind. With a complete line of water treatment products to fit any need or preference, a SpaBoss water care program makes it easy to maintain clean, safe, crystal clear water. Spa Marvel is a natural enzyme derived from plant extract. Unlike chlorine, which sanitizes and essentially attacks and kills bacteria. The enzyme helps remove the food (organic matter) necessary for bacteria to live, which is in part how lakes and aquariums can maintain themselves without chlorine. Spa Marvel will reduce your need for sanitizers such as Bromine, Chlorine, and Lithium by about 1/3 of what you would typically use. This equates to about 1-2 tbsp a week for an average user! Chemical intolerant – Traditional spa treatment causes itching, rashes, odours or coughing. “Water Treatment Challanged” – People who have difficulty following the traditional spa-water treatment regimen.. Helps to improve water clarity and quality. Helps to maintain pH and alkalinity levels. Reduces scum lines, chlorine odours and irritated eyes. Inhibits the growth of algae and biofilm when used with the recommended level of sanitizer. Just one capful (100 ml or 3.3 ounces) treats up to 20,000 gallons (75,000 litres) of pool water per week.